Meanwhile, today I have put more than 20 eye drops in a cat's eyes (Mr. Kitty, the orange tabby), given him two pills, gotten scratched in the face and chest by the kitten, and am paying $500+ for Mr. Kitty to have surgery on one of his eyes tomorrow and, although I wish he was healthier, I wouldn't trade any of my cats for anything. Sorry man, that just tickled my funny-bone. As to your problem: I feel you. I have got two cats, a white piebald female one and a black male (who is the offspring of the white one). The white one used to be really sweet in the first 2 years or so. Sit on my lap all day, always coming up to me to be petted and such. Then, some time after she threw a 4 kitten litter (of which the black cat was one) we had her sterilized (neutered). After that everything changed. I was there when my cat woke up from her anesthesia and somehow she now links the pain and confusion with me. She's lovely with my wife, but she is super scared of me. The worst thing is that she slowly but surely now infected her son. Now they're both scared. They run away when I enter the room, they don't allow me to pet them. It's as if they're traumatized. The worst thing is that I've never done them a bad deal in all their lives. I feed them, am always gentle, never raise my voice. It may sound silly, but it somehow feels like a betrayal. So there you have it: my cats hate me. I love cats. I just don't love my cats anymore, as I get nothing out of our relationship except for scratches when I try to pet them. Oh well, I just see it as 1 more cross to bear. 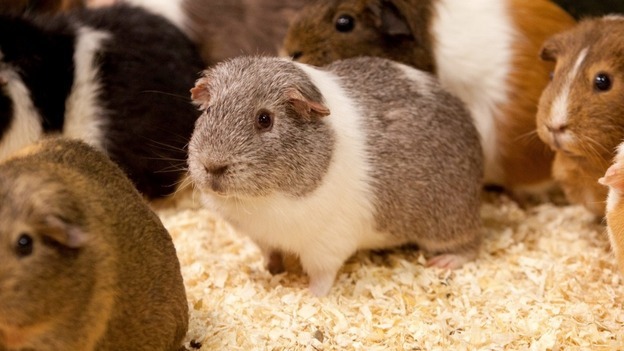 Staff at Hatton Country World in Warwickshire couldn't understand why they suddenly had 100 pregnant guinea pigs on their hands - until they released one of the male rodents had managed to escape his enclosure and infiltrate the female-only enclosure. Manager Richard Craddock said: "One of our male guinea pigs managed to find his way into the female enclosure and had a very good time by the looks of it. "We suspect a child may have placed him back in the wrong pen by accident after stroking him or Randy may have somehow broken out of his enclosure to get to the females. " 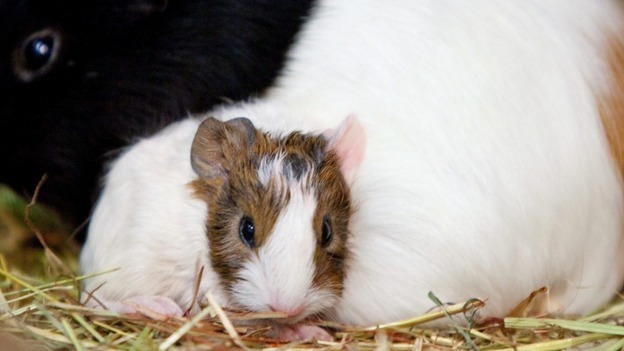 "We believe that the newly-named Randy could have impregnated up to 100 female guinea pigs, which have litters of about four, so if you do the maths we could be expecting quite a baby boom. "We don't know how long Randy was in the female enclosure but it could have been several weeks which would have given him time to go round the entire female population. "Staff did comment he looked a little thinner than before. He has now re-joined his male friends, clearly he's got a lot of bragging to do." Staff are now looking to build an extension to the guinea pig farm to accommodate Randy's huge brood. I can already picture you walking him around the block on his little leash. It'd be awesome if you could convince your daughter it is an actual dog. She's 2. She'll never know. Imagine her walking the new dog around the block. Scarred for life. Sorry for bringing this thread back again as I didn't want to create a duplicate thread for my pooch. Everyone, this is Copper he is my travel buddy. I love to bring him along wherever I go and to be honest, it really is a struggle for me to remove the fur that he usually leaves in my car. I tried a blanket but it didn't work very well so I got a dog car seat cover instead and so far it's working better than the blanket was. Now I can say that I am experiencing a convenient and hassle-free joy ride with my Pomeranian. Thanks @kenubrion, you also have a good looking puppy on your profile photo. Is that a Labrador Retriever? marge, she is a white golden retriever. Please wish Mr. Kitty your best. His eye ruptured yesterday and he had to have it removed today. He made it through surgery (not a sure thing with his poor health and age) and is being monitored overnight and I can pick him up tomorrow. This is why we need more options that just Likes. I can't Like Mr. Kitty's eye rupturing. Geez, that sounds terrible. Apparantly that can just happen!? Totally freaks me out knowing that something like that can happen. Anyways, all the best for you and your cat Sneaky. I know how much you love him! He had an eye infection and an ulcer so it didn't really "just happen" (despite what my post probably made it sound like), it was a possibility we were on alert for, and he has been seeing a veterinary ophthalmologist for 16 months. Mr. Kitty is immune suppressed due to drugs he takes for his inflammatory bowel disease, and he has an eye virus (common in cats from US shelters), and that is not a good combination. He just doesn't heal well from things that would not be much of a problem for other cats. Anyway, he had a minor setback on Wednesday and his eye socket was oozing a bit (we went back for a recheck and they shot him full of antibiotics). He is all crusty now and kind of gruesome looking (I don't handle it well, but my husband does, so between the two of us, Mr. Kitty is getting all the cleaning and medication he needs). But with one semi-working eye and a cone collar, he is jumping up to land on top a desk that is 3 feet high or so, which was surprising to me. So I guess he is doing all right. I'm glad to hear things are going better. Speaking of cats, I have a new one, as my wife and our cat finally arrived from London yesterday. He's currently charging around, demanding I throw his toy mouses and inspecting his new kingdom. i lost a budgey Sunday. he had a stroke three weeks ago meaning we converted the cage to All flat surfaces since he couldn't grip anything. and lots of "snuggle spots" he help him keep warm. but he sadly passed away Sunday night. likely the commotion of the bed collapsing in the middle of and my attempts to repair it, did him in with extra stress. So sad for you Bierschneeman. The loss of a pet is a terrible thing. And I hope your kitty is feeling better Sneaky Burrito. I have 3 cats - a calico, a tortie and a tuxedo, all female. The calico is mean. The tuxedo is a sweetheart and usually the victim of any bullying. She is also a screamer. If you dare to step even close to her tail she'll shriek, so there's a lot of hissing and growling and howling around the house. The tortie is our rescue story. I heard a kitten crying in the yard but couldn't find it. I looked all over the place but then it stopped. And the next day and again on a Sunday I finally decided I needed to solve this mystery. The cry was coming from the vents in the crawlspace of the house. I had to ask a (skinny) neighbor to crawl under the house to rescue the kitten. I have no idea how she got there. Starved, fleas, worms and a broken leg. The vet said we shouldn't even name her because she might not make it. Needless to say she was 4 last spring. And she is a very wacky cat. I always have two Budgeys and one white winged parakeet. as well as a pueblan milk snake. New since I laat was on here talking pets. Chromatopelma cyaneopubescens or green bottle blue. Heavy webber, looks nothing like this when full grown. also a Dwarf Tarantula, and like 7 ant conies, a millipede an assasin bug,.